TUESDAY, June 10, 2014 (HealthDay News) -- Pregnant or breast-feeding women should increase their weekly consumption of fish, as long as it's lower in mercury, according to new advice issued Tuesday by the U.S. Food and Drug Administration and the U.S. Environmental Protection Agency. The two agencies now recommend that women eat at least 8 ounces and up to 12 ounces per week of low-mercury fish, to support fetal growth and development. That equates to two or three servings. Young children and women who might become pregnant should also try to eat a similar amount of fish every week, the agencies said in a newly released draft of updated nutritional advice. The nutritional benefits of fish outweigh concerns about mercury, the agencies have concluded. "For years many women have limited or avoided eating fish during pregnancy or feeding fish to their young children," said Dr. Stephen Ostroff, the FDA's acting chief scientist. "But emerging science now tells us that limiting or avoiding fish during pregnancy and early childhood can mean missing out on important nutrients that can have a positive impact on growth and development as well as on general health." Added Elizabeth Southerland, director of the EPA's Office of Water: "There is now substantial evidence that fish consumption can benefit growth and development in the fetus and young children even though fish contain methyl mercury, and that this beneficial effect is much more likely to occur than harm from methyl mercury." Previously, the FDA and the EPA recommended maximum amounts of fish that these groups of people should consume, but did not promote a minimum amount. Over the past decade, however, emerging science has underscored the importance of appropriate amounts of fish in the diets of pregnant and breast-feeding women and young children, the agencies said. Fish contains important nutrients for developing fetuses, infants who are breast-fed and young children, according to the FDA. The FDA calls fish and shellfish an important part of a healthy diet, because they contain high-quality protein and other needed nutrients, are low in saturated fat, and contain omega-3 fatty acids. A balanced diet that includes a variety of fish and shellfish can boost heart health and children's proper growth and development. But, virtually all fish and shellfish contain traces of mercury. For most people, the risk from mercury isn't a worry. However, some fish and shellfish contain higher levels of mercury that may harm an unborn baby or a young child's developing nervous system. The risks from mercury in fish and shellfish depend on the amount of fish and shellfish eaten and the levels of mercury in the fish and shellfish, according to the FDA. The FDA and CDC said Tuesday that they caution pregnant or breast-feeding women to avoid four types of fish associated with high mercury levels. They are shark, swordfish, king mackerel, and tilefish caught in the Gulf of Mexico. In addition, consumption of albacore tuna should be limited to 6 ounces a week. 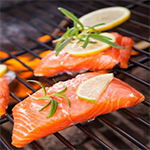 Recommended lower-mercury fish include shrimp, pollock, salmon, canned light tuna, tilapia, catfish and cod. These fish represent about 75 percent of the total market share in the United States, Ostroff said. When eating fish caught from local streams, rivers and lakes, follow fish advisories from local authorities. If such advice isn't available, total intake should be limited to 6 ounces a week for adults and 1 to 3 ounces for children, the federal officials said. People should eat a variety of fish, both to improve nutritional benefit and to further minimize potential exposure to mercury, Ostroff said. An FDA analysis of seafood consumption data from more than 1,000 pregnant women found that 21 percent ate no fish in the previous month. Those who did eat fish consumed far less than that recommended by the 2010 Dietary Guidelines for Americans, with 50 percent eating fewer than 2 ounces a week, and 75 percent eating fewer than 4 ounces a week. The agencies will consider public comments before making final the proposed changes to dietary advice. Dr. Ashley Roman is an obstetrician/gynecologist at NYU Langone Medical Center in New York City. She said: "Seafood consumption during pregnancy (and what types of fish and seafood to eat) has been an area of much confusion for pregnant women. This new advice helps to emphasize the important health benefits women can gain from including seafood in their diet during pregnancy -- both for themselves and their developing fetus." Katherine Farrell Harris, director of integrated nutrition for Advantage Care Physicians in New York City, said: "Most women know that it is important to consume enough omega-3 fatty acids during pregnancy for optimal brain development. While most women know they should consume fish, they may be unsure of the safest types that are low in potentially harmful mercury and PCBs from ocean pollution."